This portal gathers the scientific production of the research units of UPEC and UPEM (journal articles, communications, book chapters, books, reports, PhD theses, etc.). Are you a member of a research unit of UPEC or UPEM? 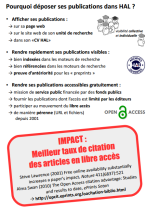 Find out (in French) how HAL can bring visibility to your research, and then create your account! Would you like to know more about the research production of UPEC or UPEM research units? Follow the links below, use the search engine over more than 21000 publications, among which more than 7000 available in full-text, or explore the content of the database by author. To create your HAL CV, first create your IdHAL, then, after connecting to your HAL account, choose the "My space" menu, then "My CV, My publications" and follow the instructions.